WINDHAM — Windham and Raymond have decided against measures that would have put a hold on new medical marijuana retail stores, while Gray has moved forward with a temporary ban on all new retail and medical marijuana operations. The local actions follow several state laws passed earlier this year related to medical marijuana. LD 1539, passed in July after legislators overrode a veto from Gov. Paul LePage, makes changes to Maine’s existing medical marijuana program. It allows medical marijuana caregivers to operate one retail store where marijuana can be sold only to qualified patients, but only if the municipality moves to allow those types of facilities. The statewide medical marijuana changes are not slated to take effect until this fall. In Windham, a handful of medical marijuana retail establishments already exist or are in the planning stages. No local ordinance currently defines or bans such establishments in the town. The Town Council voted Aug. 7 on a potential zoning ordinance change that would have created a definition for retail medical marijuana storefronts without adding them as an allowed use in any town zones, which would have effectively banned those establishments moving forward. Resident Joanne Mattiace criticized the proposal ahead of the council’s vote last week. She introduced herself as a co-owner of Legal Leaf LLC, a business on Whites Bridge Road that sells marijuana grow equipment. She also serves on the town Zoning Board of Appeals. The council narrowly rejected the proposal, voting 4-3 not to send the potential ordinance change to the Planning Board for review. If it had been passed, the measure still would have had required an additional council vote after the Planning Board recommendation before being finalized. Council Chairwoman Donna Chapman and Councilors Clayton Haskell, Jarrod Maxfield and Tim Nangle voted against advancing the store ordinance change. Councilors Rebecca Cummings, Robert Muir and Dennis Welch voted for it. Maxfield also took issue with the retroactive clause within the proposed ordinance change, which would have made the measure applicable to any project not in operation or permitted by Aug. 7. Maxfield proposed an amendment to remove the retroactive element, and that amendment also failed. 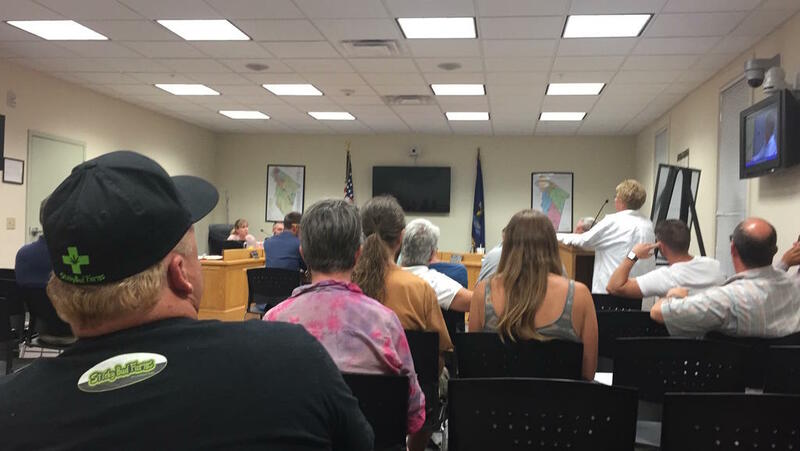 Several owners of existing or planned medical marijuana retail establishments in town addressed the Windham council at the meeting, either to express frustration about the proposed ordinance change or to offer input on the medical marijuana industry as the council continues to look at the issue. In Raymond, town voters rejected a temporary ban on new medical marijuana retail stores at a July 31 special town meeting. The special town meeting drew 51 Raymond voters, according to the town clerk. While two of its neighbors decided not to move forward with limits on medical marijuana retail storefronts, the town of Gray has enacted a 180-day moratorium ordinance on new retail and medical marijuana operations. The Gray moratorium ordinance is not only limited to medical marijuana retail stores, but also applies to new medical marijuana caregivers, dispensaries and several other types of medical and retail facilities. Maggie Terry, a co-owner of Legal Leaf LLC, addresses the Windham Town Council Aug. 7 during debate about a proposed ordinance change relating to medical marijuana retail stores.